To use this method, the hostname for the request to reroute must be 127.0.0.1:8888, localhost:8888, [::1]:8888, or the machine's NETBIOS hostname on port 8888. Click Tools > Fiddler Options. Ensure Allow remote clients to connect is checked. Create a new DWORD named ReverseProxyForPort inside HKEY_CURRENT_USER\SOFTWARE\Microsoft\Fiddler2. Set the DWORD to the local port where Fiddler will re-route inbound traffic (usually port 80 for a standard HTTP server). In a browser, go to http://127.0.0.1:8888. 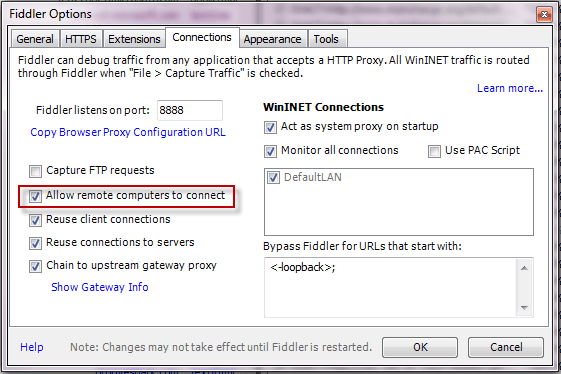 Click Tools > Fiddler Options, and ensure the "Allow remote clients to connect" checkbox is checked. Using a browser on the client machine, go to http://webserver:8888. Reconfigure your target server to listen on a different port. For example, if a web server runs on port 80, reconfigure it to run on port 81. 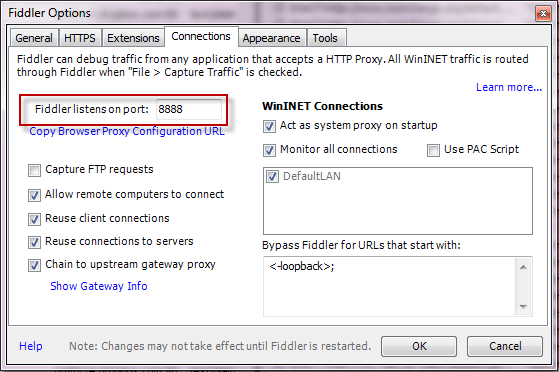 Configure Fiddler as a reverse proxy or write a FiddlerScript Rule to re-route traffic to the target server's new port (described above).